Historical significance: Edward Armitage (1817-1896) studied at the Ecole des Beaux-Arts in Paris from 1835 to 1842. He joined the atelier of the eminent French history painter Paul Delaroche (1797-1856), whose promotion of rigorous draughtsmanship and the treatment of noble themes exerted a powerful and sustained influence on Armitage's subsequent career. On his return to England, Armitage entered the competition to decorate the new houses of parliament with his cartoon Caesar's First Invasion of Britain, which won a premium. In 1847 Queen Victoria purchased his painting The Battle of Meanee. Armitage's early contributions to Royal Academy exhibitions, and a Royal commission, established his reputation as a history painter. He continued to exhibit at the Royal Academy almost exclusively until 1893. Armitage was a strong promoter of mural painting, and experimented with fresco techniques suitable for England's climate. Following research in Assisi in 1858, he executed St Francis before Pope Innocent III in buon fresco in a chapel of the Roman Catholic church of St John the Evangelist, Islington. In 1861 he used different methods for a second fresco in the church, Christ and the Twelve Apostles. 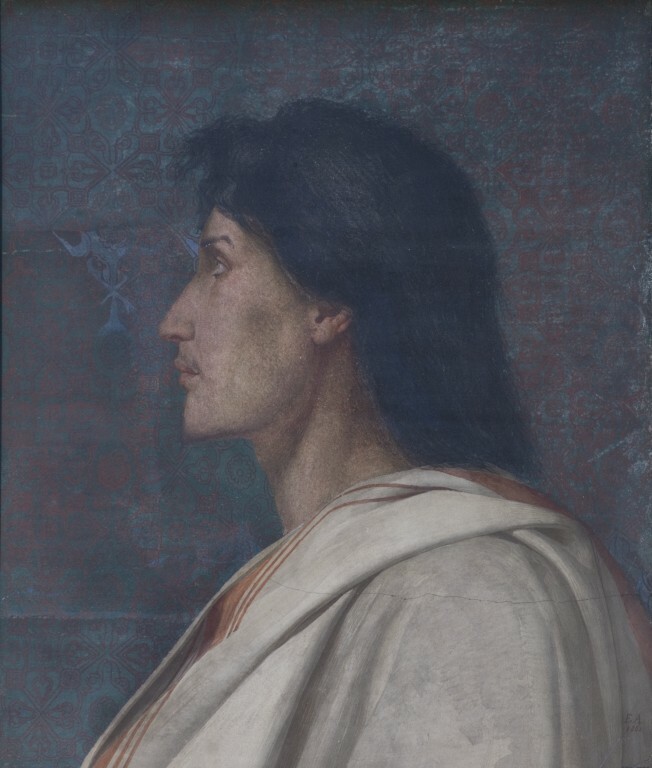 The present work, dated 1862, is a replica of part of this second fresco, showing the head of St Simon the Zealot in profile. Simon Zelotes (the Zealot) was one of the most obscure of Christ's apostles, and is mentioned in Luke 6:15 and Acts 1:13. The neo-classical solidity and simplicity of outline of the bust-length profile is modified by the saint's sensitivity of expression. Having settled in the St John's Wood area of London in 1854, Armitage become friends with the group of artists who subsequently moved to the area, the 'St John's Wood Clique'. 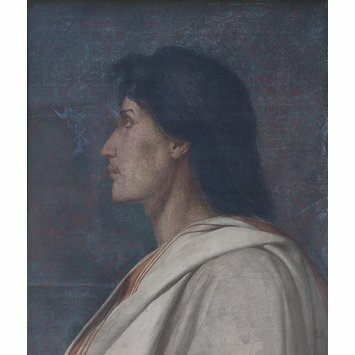 A number of these artists - David Wilkie Wynfield, G.D. Leslie, Henry Stacy Marks and W. F. Yeames - were associated with the decoration of the South Kensington Museum in the 1860s, as was Armitage himself, who was commissioned to paint a portrait of the fresco painter Benozzo Gozzoli for the so-called 'Kensington Valhalla'. Armitage made a gift of this fresco fragment to the South Kensington Museum in 1883, probably as an example of technique.